I have always been fascinated by those willing to prove their point by actually going out and doing something. It does not necessarily mean that I agree with their point, but one has to recognize their willingness to put themselves in danger to validate it. Thus I have been caught into watching the travails of the four folk who are currently trying to row through the Northwest Passage. One of the wonders of modern technology is that the passage of the four men in a rowing boat can be updated, at intervals as short as ten minutes, as the crew battle across the northern coast of Canada. Their goal is to row from Inuvik at the Mackenzie River delta to Pond Inlet, across the coast from Greenland. The boat is an especially designed rowing boat where the four men take shifts of 2 rowers at a time (on up to 4-hour stints in good weather, 20-minutes in bad) to move along the route. Figure 2. Boat Movement on Friday. The reason for my interest in this apart from monitoring the passage of folk through truly dangerous conditions where they are navigating through ice-laden waters in fog, and with the wind rising, is that they are seeking to show that boats can now make the passage. What I found particularly of note in their recent passage is that, on Friday, they dropped in on a group of beluga whale hunters. Note this post has been updated twice, with the latest (saturday night) raising the question as to whether the row is being abandoned. (Later) However, though they did backtrack for a while, they later resumed their voyage. It is particularly interesting in that the visit to the whale hunters relates back, a thousand years to when the Inuit made the same passage from Alaska chasing the bowhead whale. (It should be recognized that this reason for the move has been challenged). However the current tradition of hunting the beluga whale seems to overcome many of those objections. The more prevalent view that the Thule Inuit moved across the northern coast of Canada chasing the migration of the bowhead whales is evidenced by the use of whale bones in providing the rafters for their dwellings. They arrived in Greenland as one of the waves of immigrants that came in concert with the warming periods (earlier groups had arrived during the Roman Warming Period – the Dorset- and the preceding Minoan Warm Period). They were thus in place and the succeeding arrivals fought the earlier arrivals and the Vikings who showed up around 930 AD and who considered the natives to be skraelings. 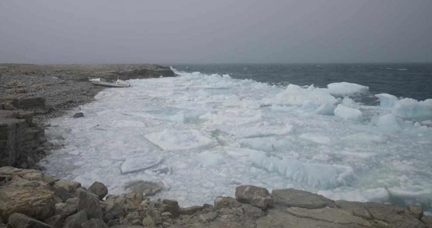 The current difficulties in terms of wind and ice floes are making it hard for the current team of four healthy men to make the passage, and they have had to drag their boat for a number of miles already, rather than face the conditions offshore. Consider then that a thousand years ago the tribes brought their families with them, and made the long migration using the umiaks of the time. 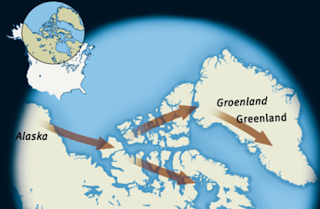 The archeological evidence mainly relates to the passage of the Thule Inuit, but the experience of the current team, though praiseworthy in its intent, does perhaps hint that conditions were somewhat easier a thousand and two thousand years ago, in what might have been the warmer waters of those times, when something other than rising carbon dioxide levels warmed the Earth. UPDATE (Saturday 12:38 pm) - There is now a video up that shows that they are stuck on a beach surrounded by ice and with heavy seas, so that they are waiting where they are until the conditions improve. This has happened before and is putting them well behind schedule. UPDATE 2 - 11:13 pm Saturday. 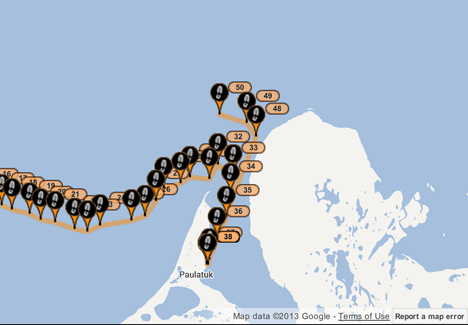 I wonder if they have perhaps given up - since the recent track tonight shows them heading back along their earlier route. 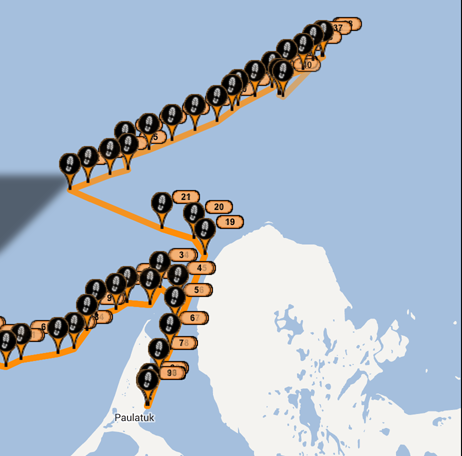 UPDATE 3: No they were just getting some headroom, and the voyage is now continuing, although it looks as though they are being driven back by a tide or some local condition, after making good progress. Figure 6. 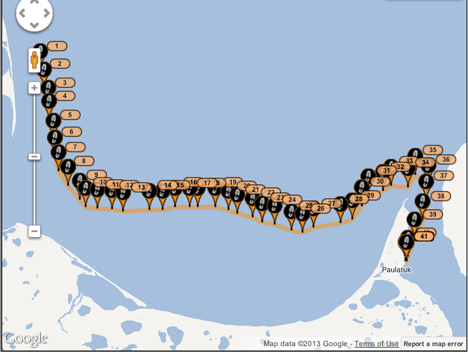 Boat position as shown at noon on Sunday.